Leon McSweeney grabbed the only goal as Hartlepool beat Bradford to progress in the Johnstone's Paint Trophy. McSweeney prodded home from close range after Andy Monkhouse had got to the byline and pulled the ball back. It was a deserved victory for Pools as the hosts had dominated - Denis Behan, Evan Horwood and McSweeney were denied by Bradford goalkeeper Jon McLaughlin. The visitors' best chance came when Luke Oliver pounced on a loose Armann Bjornsson backpass but Jake Kean saved. "It was a lot better than Saturday, but I didn't think it was an excellent performance - it was ok.
"When you're in our situation - which isn't a great one - you need everyone to work hard and stay together, and I think the players did that. "I still think we can do a lot more football, but I think that's a confidence thing - we need to nick a result or two and then confidence will come back into the players and they'll play the way I see them train." 90:00+3:30 The referee blows for the end of the match. 90:00+2:35 Short corner worked by Andy Monkhouse. 88:06 Lee Hendrie fouled by Evan Horwood, the ref awards a free kick. Free kick taken by Luke O'Brien. 86:33 Luke O'Brien takes the inswinging corner, Headed effort from deep inside the penalty area by Steve Williams misses to the left of the goal. 86:23 The ball is crossed by Oliver Gill, clearance by Evan Horwood. 85:43 Colin Larkin is ruled offside. Indirect free kick taken by Jon McLaughlin. 85:21 Neil Austin produces a cross, Steve Williams manages to make a clearance. 84:22 Jake Speight has an effort at goal from the edge of the box that misses to the right of the target. 83:03 Oliver Gill concedes a free kick for a foul on Leon McSweeney. Neil Austin takes the direct free kick. 82:25 Shot from a long way out by Gary Liddle goes wide of the left-hand upright. 81:40 Inswinging corner taken right-footed by Leon McSweeney, save by Jon McLaughlin. 80:01 Corner taken by Luke O'Brien from the left by-line played to the near post. Corner from left by-line taken by Luke O'Brien. Zesh Rehman delivers the ball, save by Jake Kean. 79:35 Gary Liddle challenges Lee Hendrie unfairly and gives away a free kick. Lee Hendrie takes the free kick. 78:58 The ball is delivered by Andy Monkhouse, clearance by Steve Williams. 77:11 Free kick awarded for a foul by Evan Horwood on Tom Adeyemi. Jon McLaughlin takes the direct free kick. 76:33 The offside flag is raised against Andy Monkhouse. Jon McLaughlin restarts play with the free kick. 73:12 Substitution Fabian Yantorno leaves the field to be replaced by Joe Gamble. 72:31 The ball is swung over by Colin Larkin. Evan Horwood takes a shot and went wide left of the target. 71:05 Shot by Leon McSweeney from outside the box goes high over the target. 70:06 Lee Hendrie takes a short corner. 68:56 Assist by Andy Monkhouse. 68:56 GOAL - Leon McSweeney:Hartlepool 1 - 0 Bradford A goal is scored by Leon McSweeney from close range to the bottom right corner of the goal. 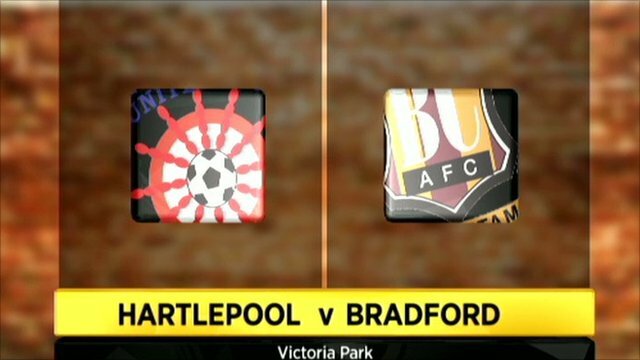 Hartlepool 1-0 Bradford. 67:04 Tom Adeyemi produces a cross. 66:08 The ball is swung over by Leon McSweeney, Zesh Rehman manages to make a clearance. 64:35 Substitution Adam Boyd leaves the field to be replaced by Andy Monkhouse. 64:35 Foul by Steven Haslam on Michael Flynn, free kick awarded. Jon McLaughlin takes the direct free kick. 64:35 Substitution (Hartlepool) makes a substitution, with Colin Larkin coming on for Denis Behan. 63:54 Gary Liddle crosses the ball, clearance made by Steve Williams. 61:12 Substitution Omar Daley leaves the field to be replaced by Michael Flynn. 61:12 Substitution Louis Moult goes off and Jake Speight comes on. 61:02 Denis Behan produces a right-footed shot from just outside the box that misses to the right of the goal. 60:17 Free kick awarded for an unfair challenge on Fabian Yantorno by Luke Oliver. Direct free kick taken by Evan Horwood. 59:09 Neil Austin delivers the ball. 58:25 Leon McSweeney delivers the ball, clearance by Steve Williams. 57:56 Luke O'Brien crosses the ball, clearance made by Denis Behan. 57:11 Gary Liddle produces a header from the edge of the box and misses to the left of the target. 56:25 Omar Daley concedes a free kick for a foul on Neil Austin. Free kick taken by Evan Horwood. 54:14 The assistant referee flags for offside against Luke Oliver. Jake Kean restarts play with the free kick. 52:32 Shot by Leon McSweeney from outside the box goes over the target. 51:39 Oliver Gill gives away a free kick for an unfair challenge on Adam Boyd. Peter Hartley takes the direct free kick. 51:10 The assistant referee flags for offside against Denis Behan. Jon McLaughlin restarts play with the free kick. 49:55 Louis Moult takes a shot. Corner from the right by-line taken by Luke O'Brien, save made by Jake Kean. 49:16 Louis Moult fouled by Steven Haslam, the ref awards a free kick. Free kick taken by Luke O'Brien. 48:22 Fabian Yantorno produces a left-footed shot from just outside the box that misses to the right of the target. 47:56 Steven Haslam fouled by Louis Moult, the ref awards a free kick. Neil Austin restarts play with the free kick. 45:00+1:19 The referee calls an end to the first half. 45:00+0:47 A cross is delivered by Evan Horwood. 43:39 A cross is delivered by Evan Horwood, Oliver Gill makes a clearance. 42:50 Centre by Luke O'Brien, save made by Jake Kean. Foul by Denis Behan on Lee Hendrie, free kick awarded. Zesh Rehman restarts play with the free kick. 41:27 The assistant referee flags for offside against Gary Liddle. Indirect free kick taken by Jon McLaughlin. 40:15 Omar Daley concedes a free kick for a foul on Evan Horwood. Fabian Yantorno delivers the ball from the free kick right-footed from right wing, clearance by Oliver Gill. 40:02 Leon McSweeney sends in a cross, clearance made by Zesh Rehman. 39:06 Denis Behan fouled by Zesh Rehman, the ref awards a free kick. Free kick taken by Neil Austin. 37:07 Denis Behan concedes a free kick for a foul on Tom Adeyemi. Jon McLaughlin takes the free kick. 35:53 Unfair challenge on Fabian Yantorno by Tom Adeyemi results in a free kick. Free kick crossed right-footed by Fabian Yantorno from left channel, Zesh Rehman makes a clearance. 34:41 Lee Hendrie sends in a cross, Jake Kean makes a comfortable save. 34:18 Peter Hartley challenges Louis Moult unfairly and gives away a free kick. Luke O'Brien restarts play with the free kick. 33:25 The ball is crossed by Peter Hartley, Oliver Gill manages to make a clearance. 32:36 Lee Hendrie takes a shot. Save made by Jake Kean. 32:14 Leon McSweeney takes a shot. Save by Jon McLaughlin. 31:02 Zesh Rehman concedes a free kick for a foul on Denis Behan. The free kick is delivered right-footed by Fabian Yantorno from left wing, clearance by Luke Oliver. 29:43 Denis Behan takes a shot. Save by Jon McLaughlin. 29:01 The referee blows for offside against Louis Moult. Jake Kean takes the indirect free kick. 28:35 Fabian Yantorno delivers the ball, Lee Bullock makes a clearance. 26:31 Omar Daley takes a shot. Save made by Jake Kean. 25:33 Adam Boyd fouled by Steve Williams, the ref awards a free kick. Free kick crossed by Fabian Yantorno, save made by Jon McLaughlin. 24:19 The referee gives a free kick against Leon McSweeney for handball. Jon McLaughlin takes the free kick. 24:02 The ball is sent over by Evan Horwood, clearance by Luke O'Brien. 22:13 Centre by Evan Horwood. 21:25 Effort on goal by Louis Moult from just inside the penalty area goes over the target. 19:21 The assistant referee flags for offside against Lee Bullock. Free kick taken by Jake Kean. 18:01 Fabian Yantorno produces a cross, Armann Bjornsson takes a shot. Fabian Yantorno takes the inswinging corner, comfortable save by Jon McLaughlin. 17:01 Inswinging corner taken from the right by-line by Evan Horwood, clearance by Zesh Rehman. 16:51 The ball is sent over by Evan Horwood, clearance made by Luke O'Brien. 16:43 A cross is delivered by Fabian Yantorno, Steve Williams makes a clearance. 14:13 Evan Horwood delivers the ball, Jon McLaughlin makes a comfortable save. 12:40 Gary Liddle challenges Lee Hendrie unfairly and gives away a free kick. A cross is delivered by Luke O'Brien, Lee Bullock produces a header from inside the area that goes over the bar. 12:00 A cross is delivered by Omar Daley. 10:30 Oliver Gill gives away a free kick for an unfair challenge on Leon McSweeney. Free kick crossed right-footed by Peter Hartley, Luke Oliver makes a clearance. 8:33 Foul by Peter Hartley on Louis Moult, free kick awarded. Luke O'Brien takes the direct free kick. 7:02 Evan Horwood takes a shot. Save made by Jon McLaughlin. 6:04 Free kick awarded for an unfair challenge on Evan Horwood by Luke Oliver. Direct free kick taken by Jake Kean. 5:27 The ball is crossed by Evan Horwood, Steve Williams manages to make a clearance. 4:03 The referee blows for offside. Jon McLaughlin takes the free kick. 3:41 Evan Horwood delivers the ball, Luke O'Brien makes a clearance. 3:29 Centre by Leon McSweeney, clearance made by Steve Williams. 2:15 Fabian Yantorno takes the inswinging corner, save made by Jon McLaughlin. 1:54 Gary Liddle takes a shot. Oliver Gill gets a block in.